This article is all about the best practices for bringing a customized industrial aqueous parts washer solution to your manufacturing floor. 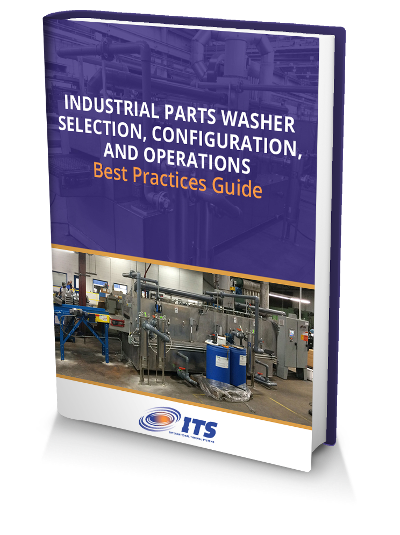 It will serve as a guide for project engineers, operations managers, purchasing agents and your C-suite for understanding the processes, decisions, and tradeoffs that are required for delivering the best quality industrial parts washer at the best value for your capital investment. Fill out the form below to get a FREE downloadable eBook. The selection and configuration of an industrial washer involves a team of sales, engineering, operations, and financial experts, all working together to manufacture the right washer that will significantly impact an OEM’s top and bottom lines. Based on your requirements and the components needed to fulfill those requirements, aqueous parts washers can range in price from the low five figures to over one million dollars. 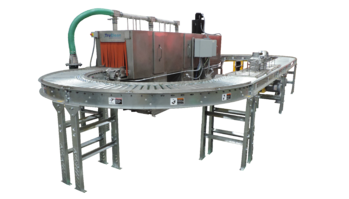 Industrial washers can be based on designs incorporating conveyor belts, monorails, rotary drums, and cabinets. Each type of design can be customized in dozens of different ways. The process of successfully integrating a customized aqueous parts washer into your manufacturing operations begins with clearly defining the requirements of the application and noting any limitations of the facility, including floor space, with the washer manufacturer’s sales and design team. From a best practices perspective, you’ll want to come to the table with your key requirements in hand. Selecting a cleaning system that best integrates into the current work flow and fulfills the cleaning requirements are basic factors for a successful project. To help select the best equipment for the application, consider the following 6 questions. Thee factors impact complexity, size, and overall cost of the washer and will ensure that the best possible cleaning system is selected. What are the parts to be cleaned? Are there sensitive geometries that might make cleaning or drying a challenge? Are the parts of a uniform shape and size or varied? What is the production rate required? Part Throughput or Production – How many parts do you need to clean per hour? Is the production rate constant or variable? What contaminates need to be cleaned or removed from the parts? Is there any chemistry that must be added to the surface of the parts? Are there Critical Areas of Cleaning/Drying? Are there areas of the parts that are more critical for cleaning or drying than others? What is the part handling process? How are the parts loaded onto and removed from the washer? What type of interface will there need to be between the washer and the material handling systems in your facility? What is the cleaning process objective? Do you have clearly defined cleanliness or dryness requirements? How will you measure compliance with those requirements? A best practice for ensuring durability of your parts cleaning equipment is to have a frank and open discussion about the skills and expertise of the manufacturer’s build team to make sure that they have the experience to deliver a well-built aqueous parts washer that will last for dozens of years. Take the time to learn about the customer support offered during installation and throughout the life of the machine, Ask about which services will be included in the proposal, and which services are offered as an option. Discuss installation, repairs and preventative maintenance during step 1 to fully understand how the manufacturer will respond to your questions and any equipment issues. We recommend that your team include the facility or plant manager, purchasing agent, and a C-suite decision maker who can collectively review the quote from quality, process and cost perspectives. Take the time to visit the manufacturer’s facility to tour and learn more about their build process and organization. After all of the application requirements have been determined, the project will move to the initial design of the custom washer. A typical design process for your custom parts washer will require several weeks to complete. During the design process, the manufacturer’s Application Engineer will work on the selection and configuration of components ranging from controllers to housing, and may include the scientific testing of the design. Installation specifics - what services does the manufacture offer, what will be handled by your team and what will be handled by the manufacturer during the install? Operator Training - is training included or an option? A reputable washer manufacturer will have a test lab within its facility. A best practice for stringent cleaning requirements is to send the parts to the manufacturer’s lab to verify the wash process. The parts will be returned with a detailed lab report. You can be assured that the recommended wash process has been verified and your industrial parts washer will work as specified from day one after installation. Relying on accurate, customized scientific results, instead of using historical evidence from previous washer design and build projects, will help your entire team have the confidence that the customized washer they’re purchasing will meet requirements ranging from footprint restrictions to the degree of part cleanliness required. For some applications, parts testing is not a necessary step, and the process moves onto the detailed design of the parts cleaning equipment. After defining the application requirements, testing the part, if needed, hosting an onsite visit and visiting the manufacturing facility, and completing the initial design phase, the industrial washer manufacturer will deliver a detailed quote. After a contract is signed, the project moves to detailed engineering. At this time, the manufacturer may assign a project engineer to oversee the project. The project engineer may present an operational review to your entire team. Once the mechanical drawings are approved, the build phase begins. Since it’s likely that you’ll be logging tens of thousands of hours and washing millions of parts during its life, you’ll want to have the comfort of knowing that your custom washer has been meticulously engineered for durability and built to your exact specifications for the long haul. During your initial facility tour, make sure to stop and notice the equipment that is being built on the floor. Pay attention to the detail of their workmanship. As your machine is being built, stop in during the manufacturing process to see the work in process. If your location is too far from the manufacturing facility, request photos be sent every few weeks. The manufacturer will perform quality checks throughout the build of the washer and after the build is complete, the manufacturer's quality control team will test the washer to verify that all components are working and to make any needed adjustments. Your team will be invited to the manufacturer’s facility for a functional test of the washer. A typical QC test will include testing the amp draws, pump pressures, air flows and conveyor speeds. If applicable, the PLC and HMI will be demonstrated, tanks will be filled with water, pumps will be run, and leak checks will be conducted on the welding and piping. After verifying the machine is working as specified, the washer will be cleaned, prepped and packed for shipment. Your new washer has been delivered! Because you followed the best practices in step 1 of discussing installation, training and service, the startup of the machine should be seamless and the machine will be up and running on schedule. The Customer Support team will be your source for installation, operator training, preventative maintenance, replacement parts and any operating question throughout the life of the machine. A strong customer support team is the assurance that if there is a problem, you have experienced technicians and resources for a quick resolution. To maintain maximum efficiency and performance levels of the industrial washer, a maintenance schedule should be established. Manufacturers offer equipment audits and preventative maintenance programs. Establishing a strong rapport and relationship between your team and the manufacturer’s customer service staff, technicians and trainers, is a worthy goal. The manufacturer’s mission is to make sure that you are meeting your customer’s needs and requirements for clean parts over the long haul and that during the operational life of the washer, your downtime will be as minimal as possible. In industries ranging from aerospace to food and beverage, ITS has been delivering custom industrial washer solutions for more than 30 years. Our designs include single- or multi-stage configurations and a wide variety of materials handling designs for either batch processing or a continuous product flow process. For more details and specifications, visit our Aqueous Parts Washer page and watch a short video on our approach and capabilities for building a custom washer that will meet your requirements at a reasonable price.